Children Hearing Voices is a unique, innovative book providing support and practical solutions for the experience of hearing voices. It is in two parts, one part for voice-hearing children, the other part for parents and adult carers. Sandra Escher and Marius Romme have over twenty-five years experience of working with voice-hearers, pioneering the theory and practice of accepting and working with the meaning in voices. This book has mainly been written for children who hear voices. The information in this book is largely derived from a three-year study amongst 80 children and adolescents who were interviewed about their experiences; children who ranged in age from 8 to 19 years at first contact. Little is known about voice hearing in children. Most people still have this notion that it is a disease for life. 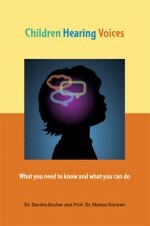 In this book, readers will find extensive information about how to look differently at voice hearing; learning to deal with it and discovering what might help to cope with the voices. It became increasingly clear to us how little information parents of children hearing voices were getting and that if parents found information, it was almost always based on the assumption that voice hearing was a serious disease. We noticed that the children of those parents who dared to search and go their own way were doing better. This book is for these parents. Marius Romme, MD, PhD, was Professor of Social Psychiatry at the Medical Faculty of the University of Maastricht ( Netherlands) from 1974 to 1999, as well as Consultant Psychiatrist at the Community Mental Health Centre in Maastricht. He is now a Visiting Professor at the Centre for Community Mental Health, Birmingham City University. His research over the past twenty-five years has focused on the voice-hearing experience. My mother heard voices, and I wouldn’t say that I am “doing better”, but I am living in a better time, I think? It would be nice to hear some stories from other people to make sense of this all.